AC Milan, oficiálním názvem Associazione Calcio Milan 1899, je milánský fotbalový klub, který se účastní italské Serie A. Hrají v dresech s červeno černými pruhy a černými šortkami, kvůli čemuž mají přezdívku rossoneri („červeno-černí“). Po Juventusu je to druhý nejúspěšnější italský klub. AC vyhrál 17× Sérii A a 5× italský pohár. Klub se také může pyšnit sedmi tituly v Lize mistrů. Historicky měl AC Milan podporu u dělníků a nižších tříd, oproti Interu, který byl podporován hlavně vyššími vrstvami. To již ale v současnosti není pravda a klub vlastní nejbohatší člověk Itálie a italský premiér Silvio Berlusconi. * V současnosti hraje za tento klub i český obránce Marek Jankulovski. * Od ledna 2009 by měl za AC Milan nastoupit legendární anglický fotbalista David Beckham na hostování. Jinak je pořád hráčem amerického týmu Los Angeles Galaxy. Associazione Calcio Milan, commonly referred to as AC Milan and as simply Milan in Italy, is an Italian professional football club based in Milan, Lombardy. 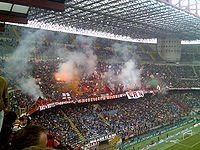 The club was founded in 1899 and has since spent most of its history in the top flight of Italian football. Milan has won 18 officially recognized international titles, tied with Boca Juniors as having the most in the world. The club have won what is today known as the UEFA Champions League on seven occasions; only Real Madrid have won it more times (9). As far as Italian competitions are concerned, Milan is the second most successful club with 17 league titles; only Juventus have won more (27). AC Milan have won four world titles, more than any other club in the world. They have won 3 times the Intercontinental Cup, and 1 time the FIFA Club World Cup. Other important titles which Milan have won includes the European Super Cup five times, and the Cup Winners' Cup twice; however, they have never reached the UEFA Cup final (only two semi-finals). In Italy, they have won the Coppa Italia five times, as well as five Italian Super Cups. AC Milan is also one of the G-14’s founding members, a group that represented eighteen of the largest and most prestigious European football clubs before its disbandment. Od ledna 2009 by měl za AC Milan nastoupit legendární anglický fotbalista David Beckham na hostování. Jinak je pořád hráčem amerického týmu Los Angeles Galaxy.